Old Dunhill made the best ones that I've seen, in my opinon. This is off of a patent era Dunhill. It had the best stem and button work that I've ever put in my mouth. Notice how, in addition to gracefully flaring out at the sides, it has a little bit of concavity at the button end. I should mention that this stem was thin too. 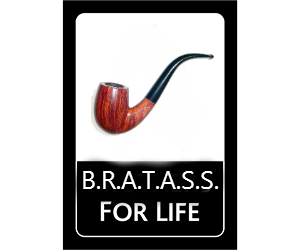 I prefer smaller pipes and I think fishtail stems provide some visual and practical balance to a small pipe. In some cases, they are almost necessary to give your teeth enough real estate to clench. I like how pronounced they look on a small pipe with a thin shank. Dunhill is the only maker that I've seen that also has that little bit of concavity at the button end. The stem on this Ashton of mine is almost a fishtail. The flare is is more subtle and straight line. It's hard to tell from the photo. Anyone else out there really like a pronounced fishtail? I know Pete produces fishtails and I've seen an artisan maker, Scottie, that makes a lot of nice fishtails. Any others? 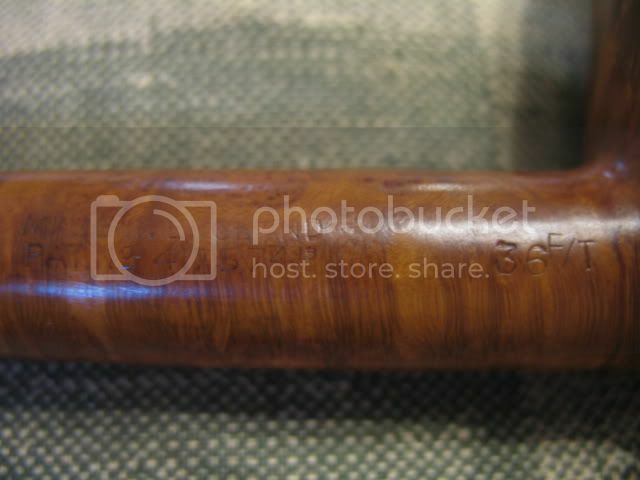 Any of you CPS pipe makers ever try making a fishtail stem? Last edited by Cleon on Thu Dec 06, 2018 10:48 am, edited 1 time in total. Currently having some Carter Hall in a JMG pipe with a really nice fishtail stem. I love fishtails. I don't own one anymore, unfortunately, though. They are harder and harder to come by these days. They seem to have fallen out of favor over time. I surmise that it might be because pipes have gotten bigger and bigger over the years and fishtails seem to be a more valuable asset on small pipes for some of the reasons I mentioned above. I have collected, refurbished, and sold a gob of pipes. In my experience the fishtail was more common, say, pre-war. At least for Dunhill. Just thinking out loud. I have a fair number of fishtails. I like them as well. If memory serves, more than a few have a concave end on the button. I’ll look and see how accurate my memory is and try to post photos. I'm now starting to wonder if Dunhill invented the fishtail. 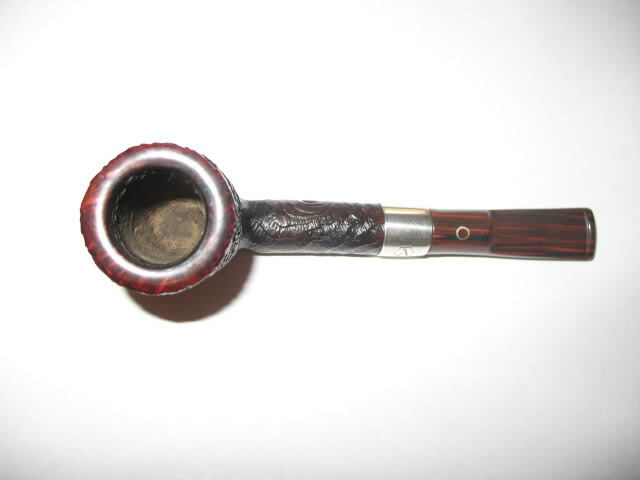 I do know that if you want to buy an old estate Dunhill fishtail you should look for the designation F/T in the nomenclature stamped on the shank if it isn't obvious from just looking at the pipe. Can you tell that Dunhill is my benchmark? Last edited by Cleon on Thu Dec 06, 2018 12:29 pm, edited 1 time in total. I don't know if that concave end on the button is part and parcel of what makes a fishtail a fishtail. I do know that they are more pronounced on the Dunhills I've handled compared to the few other makes I've seen. I'm now starting to wonder if Dunhill invented the fishtail. 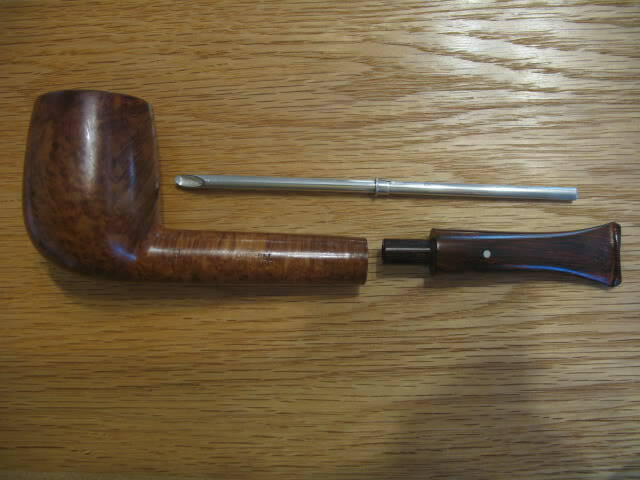 I do know that if you want to buy an old estate Dunhill fishtail you should look for the designation F/T in the nomenclature stamped on the shank if it isn't obvious from just looking at the pipe. Not a bad choice for a benchmark. And Randolph Scott. Dont forget Randolph Scott. Seriously, though, I think Cleon is right. I have a 1950 group 3 apple with a fishtail stem of extraordinary thinness and comfort. Its wonderful. Comoys 3 part C's for briar quality. Patent Dunhills for stem work. I didn't get to like handmade pipes until relatively late in life and I still view freehands askance. The biggest change I cant quite get behind is the wide open airway. Cant tell you how many times I've accidentally ingested tobacco bits or hot coals. I have wanted to get a small pipe of some sort made by one of the CPS makers. The catch would be that I'd send them all kinds of pictures of that Dunhill stem and ask them to recreate it. I'm sure they'd end up foeing me. Just thinking. There's a big emphasis nowadays on big ol' open airways. I'm sure that plays a part in how thin the bit can end. Last edited by durangopipe on Thu Dec 06, 2018 6:25 pm, edited 1 time in total. This has turned into more of a project than I feared. Seems a "fishtail" is as hard to cleanly separate from other stems as it is to know what the meaning of "is" is. I went through my racks and cabinet (always looking for a pretext to do just that) and clearly found a few that were not only flared at the end, but had concave buttons - to some degree. 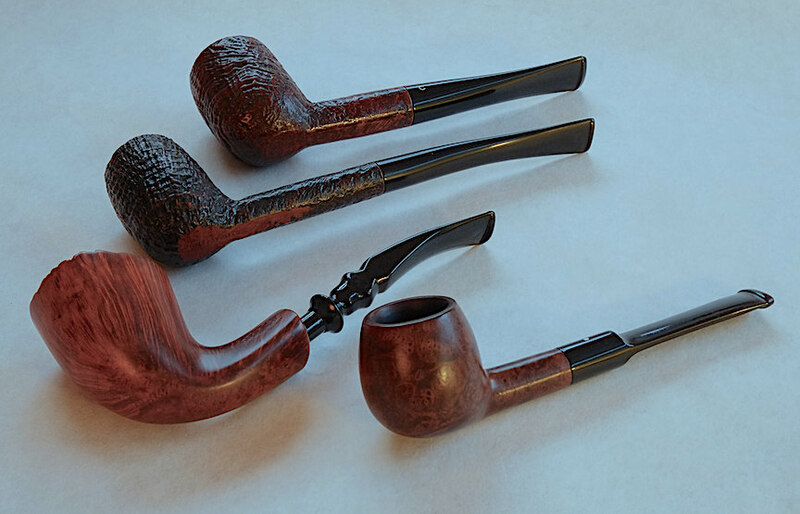 They include a lovely group 3 Dunhill Apple, a 3-piece Comoy's Billiard, a Savinelli Punto Oro Bing's Favorite and the recently restored Erikson freehand. My two Churchwardens could not be called anything but fishtails. They had, by far, the most pronounced flare. But no concavity. Only 3 of my several pipes that Peterson calls fishtails had a stem even beginning to resemble an actual fishtail, and even two of those barely made the cut. Then, there were ten or so more I'd be willing to call fishtails, all without any concavity and greatly varying in amount of flare. Some would say, yes, fishtail. Others, probably not. Why is it that any question regarding the minutiae of pipedom quickly becomes a metaphor for the deeper questions of life itself? Why does so much seem to become a matter of through a glass darkly? This fishtail exercise reminds me of a chapel message I listened to 39 years ago. The professor delivering the message was a thoughtful and profoundly scholarly Christian gentleman, Dr. Tamashiro. After a lot of somewhat dry if very meaningful and thought provoking content, sprinkled here and there with an occasional joke (one I well remember about a sacred cow in the living room of his parents' home munching on their hippie son's long hair as he napped on the couch during a visit home from college), he ended the message by saying, "When I look at human behavior I very clearly see much black. I very clearly see much white. But I'm afraid there is far too much gray that I see for me to be comfortable making a judgment." 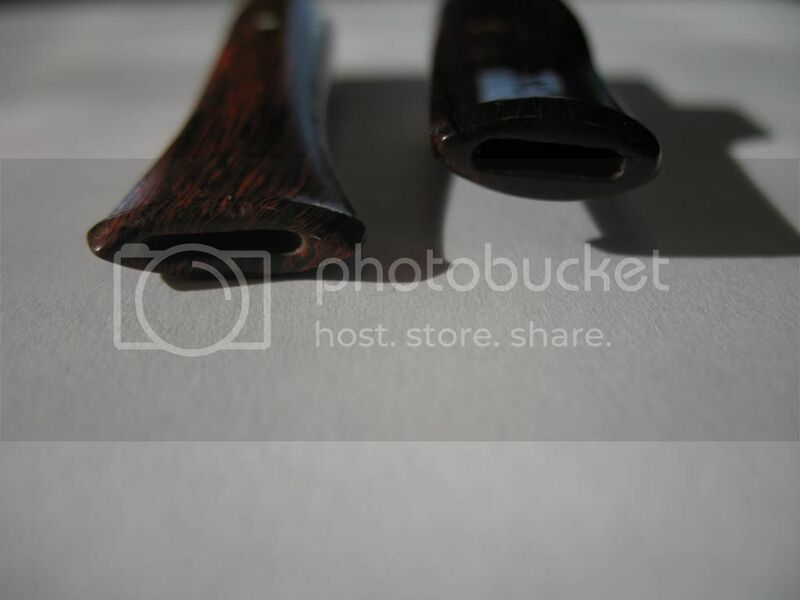 When I look at my pipes, I see a great variety of stems and variously shaped buttons and bits. I see a lot of fishtails. I see a lot that are not fishtails. But I'm afraid there are far too many I cannot categorize so simply for me to be comfortable. And a few, as well, that appear to have been munched on by a sacred cow. Last edited by durangopipe on Thu Dec 06, 2018 6:31 pm, edited 3 times in total. I was losing light and had to stop. I was losing light I first read that as, I was losing weight. I wondered what the what and to reread it. and had to stop. They are all very nice but that gold dot...woof!